The Gannon University football team celebrated two weeks packed full of homecoming, broken records and a win against a team the program had never before beaten. The end result is a two-game winning streak that the Knights will take into Saturday’s noon matchup against Indiana University of Pennsylvania at McConnell Family Stadium. Two Saturdays ago, Gannon celebrated homecoming by watching Marcus Jones rumble and stumble for 264 yards and four touchdowns on the ground to break Gannon’s career rushing record. Jones passed Sterling Pierce, who accumulated 3,334 yards during the 1996-99 seasons. In the process, the Knights earned their first win of the season, defeating Seton Hill, 48-28, at McConnell Family Stadium. 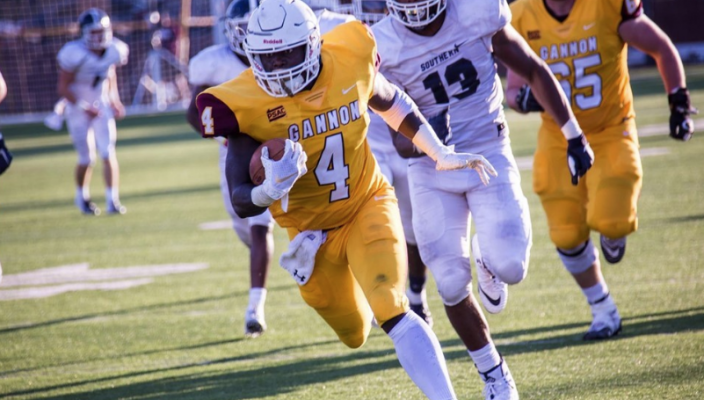 A week later, Gannon kept the train rolling, traveling to California University of Pennsylvania and spoiling the Vulcans’ homecoming weekend with a 29-15 victory. It marked Gannon’s first win against California in program history. Jones once again had a tremendous day on the ground, rushing for 276 yards, and the Knights’ defense put together perhaps its best outing of the season. California struck first on its opening drive to take an early 7-0 lead. The Knights responded with 15 unanswered points, though, on an 11-yard run from Jones, a 25-yard field goal and a 94-yard Dontae Owens touchdown pass from Jason Dambach. Gannon’s defense locked in and never trailed from there, as it sealed the convincing win that left the Knights 2-5 overall and 2-2 in Pennsylvania State Athletic Conference West play. Romell Jones led the bruising defense with nine tackles. Gannon held California to 321 yards of total offense, including just 82 yards rushing, while the Knights rolled up 500 total yards – 333 on the ground and 167 through the air. Dambach and Owens teamed up for their second touchdown pass of the day, a 19-yarder to close out the scoring late in the fourth quarter. Jones also scored on an 8-yard run. Dambach’s 94-yard pass in the third quarter broke Gannon’s record for longest pass play in school history. After CalU’s opening drive the Knights’ defense allowed only 260 yards on 52 plays. Against Seton Hill, both teams started slowly as the Knights didn’t strike first until the last possession of the quarter to go up 6-0 on Jones’ 43-yard touchdown run. An A.J. Satcher interception gave Gannon the ball back with a short field early in the second quarter. Jones converted the turnover into a 12-yard touchdown. Seton Hill answered, but the game was all but over from there as a 100-yard Martell Davis interception return for a touchdown gave the Knights a commanding 27-7 lead early in the second half. Gannon needed an explosive statement from its offense, and the Knights got one, as their shortest touchdown scored in the second half was from 47 yards out. That Jones run was followed by a 70-yard run from Dambach and another 58-yard scamper from Jones. James Simms recorded a season-high 12 tackles and forced a fumble to lead the Knights on defense. Jones now has 988 yards rushing on the season with four games remaining. Dambach finished with an effecient 9-for-16 through the air for 102 total yards. He also recorded a touchdown and 77 rushing yards. Up next, Gannon will host the Indiana University of Pennsylvania to begin a stretch of three of its final four games at home. IUP (5-2 overall, 2-2 in PSAC play) reached as high as No. 2 in the national polls, but just recently snapped a two-game skid against Clarion. The Crimson Hawks currently sit at No. 23 in the polls.